The Bark River Bushcrafter fixed bladed knife with green canvas micarta scales is a scaled down version of the popular Bark River Bushcraft. The 3.875" Crucible CPM-154 stainless steel blade combines toughness, edge and corrosion resistance. Contoured green canvas micarta scales provide a comfortable and secure grip in hand even after prolonged use. Excellently well balanced, the 6.6 ounce weight is barely noticeable in hand or on your belt with the included hand made leather belt sheath. Sturdy Crucible CPM-154 stainless steel blade will tackle any small detailed camping/hiking chores. 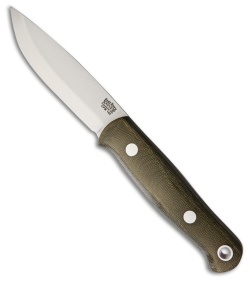 Ergonomic green canvas micarta handle scales offer lasting comfort.